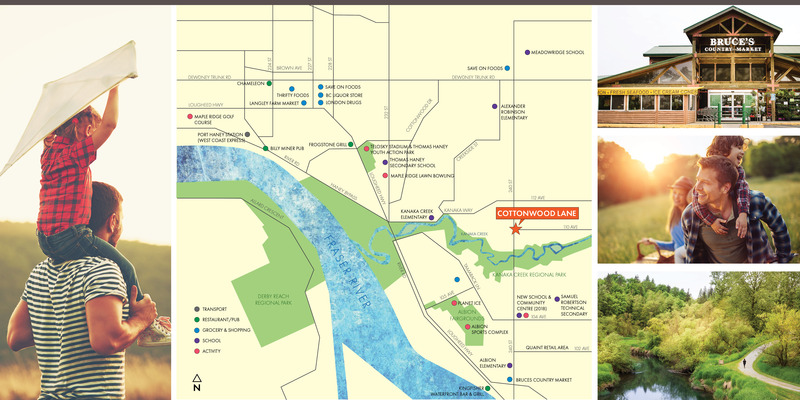 Cottonwood Lane is located in the historic neighborhood of Albion Maple Ridge. Kanaka Regional Park at your doorstep will connect you directly to the natural beauty of the area. Proximity to transit, award winning schools, and sports amenities gives residents and their families the opportunity to experience all that this up and coming neighborhood has to offer. Kanaka Creek Regional park – Let its sandstone cannons and beautiful vantages of the Fraser River be your backyard for exploration and connection to nature. Whonnock Lake Park is a perfect weekend spot for families of all ages. Pack a picnic lunch and go swimming, canoeing, play frisbee or just chill at the beach. Newlyweds are often spotted taking advantage of the stunning views for wedding photos. Fishing lovers know that Maple Ridge is the spot to drop line: Kanaka Creek, Whonnock Lake, Fraser River, Alouette River, Mike Lake or Alouette Lake (Golden Ears Provincial Park) are at your doorstep. Maple Ridge Dyke offers scenic trails that are flat and easy for young kids and seniors. Enjoy the gorgeous views of the mountains while biking, walking or horseback riding. Golden Ears Provincial Park is prized for its recreational opportunities, hemlock forest and mountainous back country. The park’s extensive system of trails provides excellent opportunities for hiking, horseback riding, and camping. Alouette Lake offers large campgrounds and is a popular spot for swimming, windsurfing, water-skiing, canoeing, boating and fishing. Maple Ridge Mountain Biking Skills Park is divided into 4 areas, offering diverse paths and different sections for different skill level riders. WildPlay Element Parks offers a wide variety of activities to let your adrenaline out to play! There are 9 ziplines, 62 aerial games, and a 40ft jump. But don’t worry, there are multi-level adventures from wild to mild, for both the strong-hearted and the faint-hearted. Maple Ridge has some of the best Primary and Secondary schools in BC, providing innovative and advanced education. Thomas Haney Secondary – promoting self-directed learning (SDL) as well as a Microsoft IT and Adobe Certification Academy. Meadow Ridge School – a private International Baccalaureate (IB) Continuum World School, accredited through multiple organizations that provides advanced education from K to G 12. Bruce’s Country Market is a Maple Ridge staple, specializing in fresh wild salmon caught by their own gillnetters. The signature smoked salmon, prepared according to their traditional family methods, is something you don’t want to miss! You can also find a wide variety of groceries, organic produce, and a gourmet deli. The Haney Farmers Market opens from April to November annually, offering a wide range of seasonal produce, artisan baking goods & treats. You can’t beat the taste of farm-to-table freshness! With the Golden Ear Bridge, Pitt River Bridge and Highway 7, reaching other neighbhourhoods in Greater Vancouver is easier than ever. This is not an offering for sale. Any such offer can only be made by way of disclosure statement. E.&.O.E.